Have you ever wished you could make enough dinners to last a month in less than 2 hours? 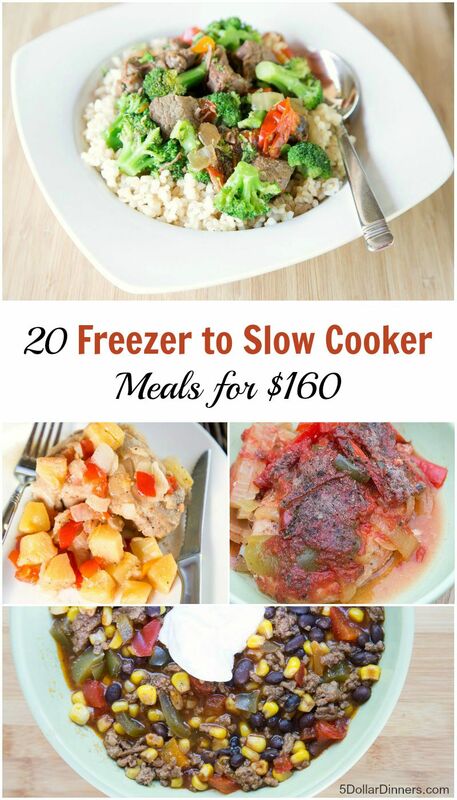 All of these new recipes are “Freezer to Slow Cooker Recipes” with very minimal prep. Just load up all the bags with the ingredients and freeze them. Then you can take the meal you want, thaw it partially in the fridge overnight or in a bowl of warm water on the counter for 20 minutes and drop all the ingredients into the slow cooker. In this brand new meal plan, you’ll find 6 chicken recipes, 8 ground beef recipes, 2 pork chop recipes and 4 stew beef recipes. We have a mix of flavors from TexMex to Asian and Tropical Island too. Grocery Store Shopping List – one shopping list for the grocery store, if you plan to shop for all the ingredients at once from the grocery store. We have adjust quantities to what you will actually need. Grocery Store “by Meat Type” Shopping List – one shopping list for the grocery store, broken down by type of meat…so that when that meat is on sale, you can buy just what you need for those recipes and assembly those meals. getting the meat when it’s on sale can cut at least $20-$30 off your total bill for all these ingredients. This shopping list can also be used to make just a few meals at a time, say if you have a limited freezer space, or the thought of putting together 20 meals at once feels overwhelming! Now…for the amazing recipes and other goodies and new twists you’ll find in this plan! Each pack in this plan is DOUBLED except for the pork chops, so these 11 recipes make 20 packs total! Each pack is portioned to serve a family of 4. Larger families or families with bottomless pits (also known as teenage boys!) can double or use 2 packs for 1 meal! I’ve also included suggested side dish ideas on the recipes and shopping list! Can I get a YUM!!!!!!!!!!!!!!! The total for all the ingredients after the leftovers $158! As always, you can expect the same great shopping list, recipes list, printable labels, assembly instructions and access to exclusive video of yours truly assembling all the meals. It took me LESS THAN 2 HOURS to get them all together and into the freezer…and you can watch the video of the assembly process so you don’t feel alone in your efforts! So, it’s time to grab your meal plan and get your freezer loaded and you’ll be all set for this busy back to school season! Printable Labels - you can print these out onto Avery #6874 label paper and stick them to your plastic baggies or containers. Instructional Assembly Videos - exclusive access! Find the New Work & School Lunches Meal Plan Information here! You can find the all of the other 20 Meals for $150 Meal Plans, as well as 6-Week Specialty Meal Plans and more in the $5 Dinners E-Store. Once you’ve chosen all the ones you need to make life in the kitchen easier, you can checkout and get all the printable at once!